Irvine, Calif. – R.D. Olson Construction is commencing construction on its latest luxury hotel project, The Bicycle Casino Hotel in Bell Gardens, Calif. Through this $45 million project, R.D. Olson Construction will create approximately 300 construction-related jobs in a community that is currently experiencing 16.3 percent unemployment. R.D. Olson Construction and The Bicycle Casino celebrated this significant contribution to the area’s economic turnaround with elected officials Governor Edmund G. (Jerry) Brown, Jr. and State Senator Ricardo Lara at yesterday’s ceremonial unveiling. 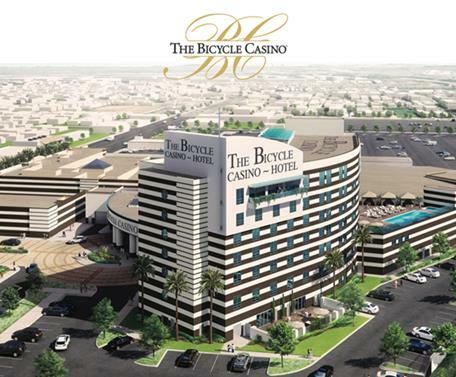 The Bicycle Casino is currently the largest employer in Bell Gardens, and the 100-room, luxury hotel project will have a meaningful economic impact on the area, creating 250 new hotel and casino jobs. Construction is planned for completion the first quarter of 2015. “R.D. Olson Construction is proud to be a part of a project that will have such a profound economic impact on an area in need of stimulation,” said Bill Wilhelm, executive vice president of R.D. Olson Construction. Located at the corner of Bicycle Casino Drive and Eastern Ave., the Bicycle Casino Hotel sits in the heart of Bell Gardens. The hotel’s modern design will cater to casino and leisure guests alike. 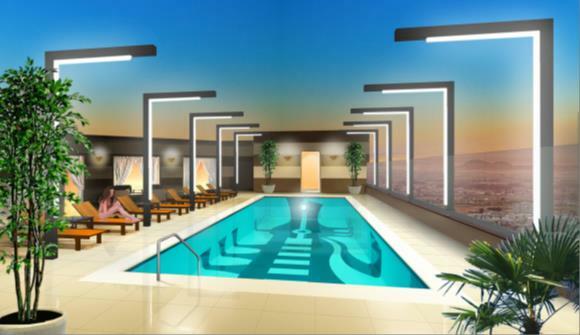 The seven-story, 117,907-square-foot hotel will feature a bakery/cafe, restaurant, penthouse nightclub, roof-top open air gaming area, health spa, fitness center and second floor, elevated swimming pool with cabanas. When complete, the casino and hotel will have more than 15,000 square feet of event, meeting and function space. R.D. Olson Construction is a recognized leader in hotel construction and has been building at a rapid pace, with eight new starts over the last 24 months alone. R.D. Olson has completed the Fairfield Inn and Suites in Tustin, Calif., Residence Inn hotels in Tustin and San Juan Capistrano, Calif., and Courtyard by Marriott hotels in Santa Barbara and Oceanside, Calif., and Maui, Hawaii. Earlier this year, the firm completed the nation’s first Legoland Hotel at Legoland California Resort in Carlsbad, Calif., and the company is currently under construction on the eight-story, 210-room Courtyard by Marriott Irvine Spectrum that is scheduled to open in the summer of 2014.